This paper presents a new theoretical and computational approach to optimal taxation. From a theoretical perspective, the main innovation is the introduction of capital taxation into a static tax mix model. The analytical model presented here provides approximate predictions for optimal linear tax rates, called the modified inverse elasticity rule. Using this rule, we examine the optimal linear taxation of capital, labour and commodities. Next, we study a computational model involving non-linear taxation, defined by different marginal tax rates on labour and capital over different population groups. 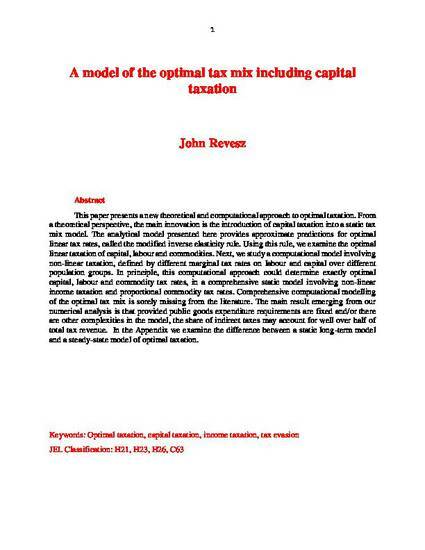 In principle, this computational approach could determine exactly optimal capital, labour and commodity tax rates, in a comprehensive static model involving non-linear income taxation and proportional commodity tax rates. Comprehensive computational modelling of the optimal tax mix is sorely missing from the literature. The main result emerging from our numerical analysis is that provided public goods expenditure requirements are fixed and/or there are other complexities in the model, the share of indirect taxes may account for well over half of total tax revenue. In the Appendix we examine the difference between a static long-term model and a steady-state model of optimal taxation.